7:30 am. We had a good night at the guesthouse and the warm shower felt wonderful. We met for breakfast and met two other college students who are in engineering who are here for the summer helping with water projects in jungle villages near Shell. They would find springs that were the water source for the villages and then do the work on them to help assure the water stayed clean. This included a lot of education for the village people as well. Jane picked us up about 9 am and we went to the Equator Monument Park. 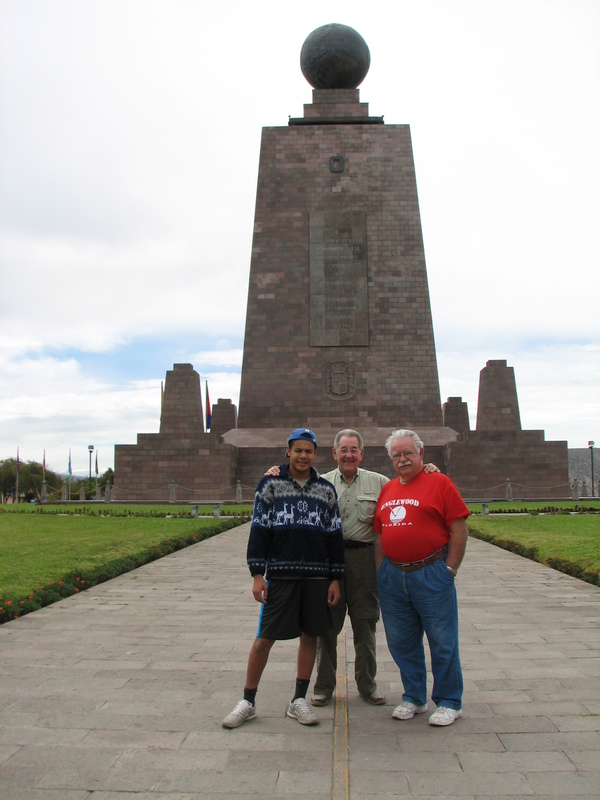 At this place there is a large monument standing on the equator. There are several shops and restaurants in this park. We enjoyed walking around looking in the shops and standing on the equatorial line that separates the north and south hemispheres. The sun was directly overhead and was intense. We had lunch in one of the restaurants and then left to drive about an hour out from Quito to an area called the cloud forest. At this area there are tall mountains covered with trees, tropical plants and grass. Tony and Barb Nunnery live here and have developed an area on the side of the mountain where they have built a home and built a hummingbird preserve. 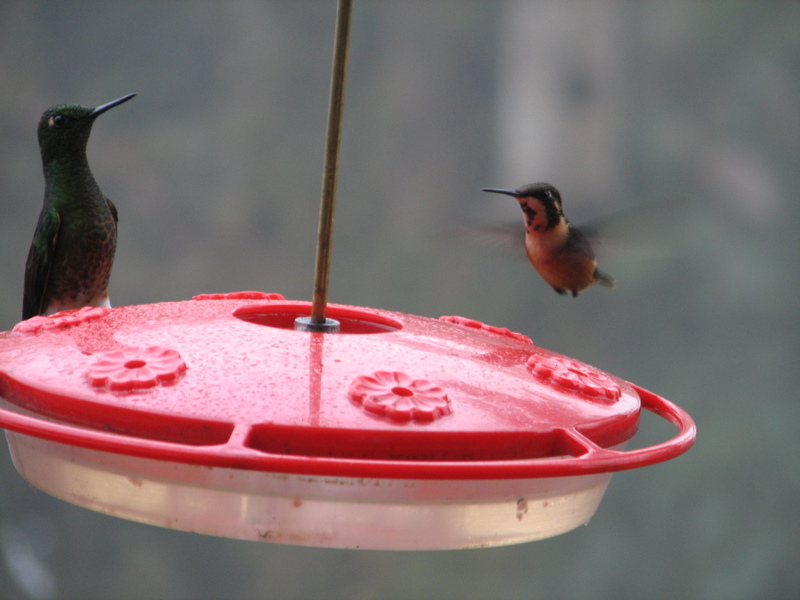 Their back yard has several hummingbird feeders and these feeders were busy, sometimes with 6 or more birds feeding at once. 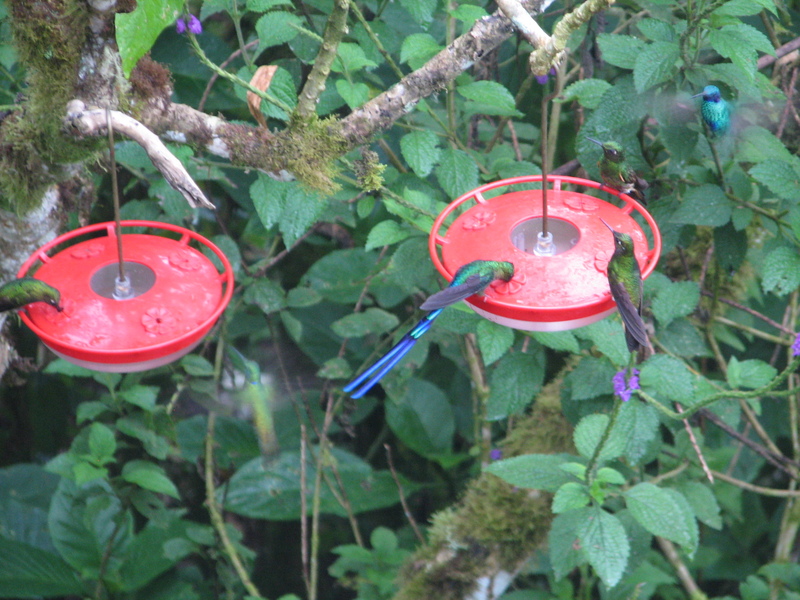 This area has the highest concentration of hummingbirds in the world. Tony has identified 42 different species of hummingbirds in his back yard. We spent the afternoon sitting on their back porch talking with Tony and Barb and enjoying the conversation. Tony told about the history of the place, how he acquired the land, built the house and wanted to develop a sanctuary for the hummingbirds since there were so many. This involved planting flowering bushes that hummingbirds like as well as putting up multple feeders. 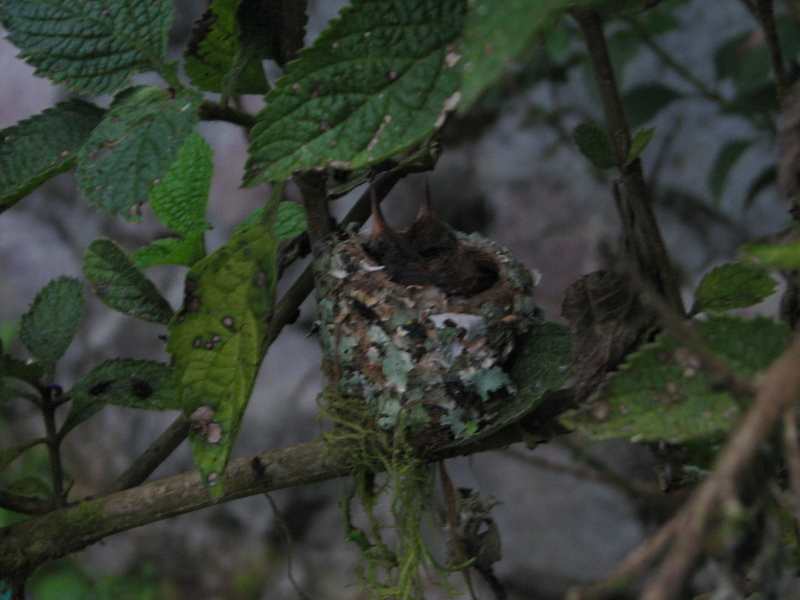 He has developed hiking trails all around the area where one can stroll and see hummingbirds in their natural habitat. 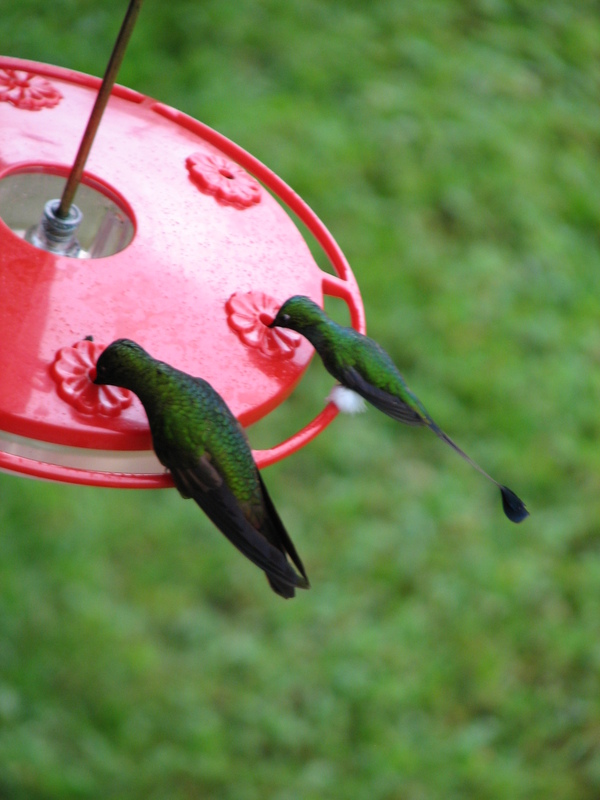 Watching these hummingbirds was truly fascinating. I kept thinking about God’s creativity and how much fun He must have had making all these different kinds of beautiful birds. 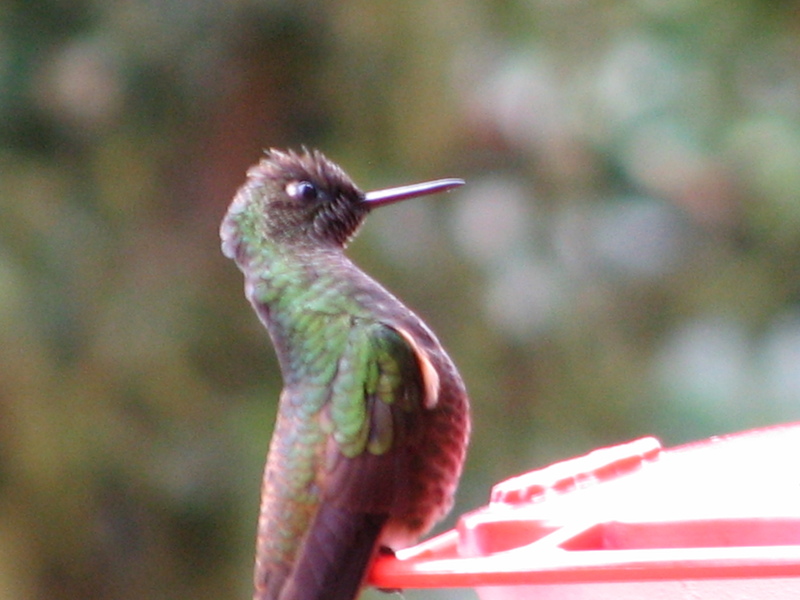 Tony said the hummingbirds must eat about every 15 minutes. At night their metabolism slows down to the point the birds are in a stupor so they can rest without having to eat all the time. 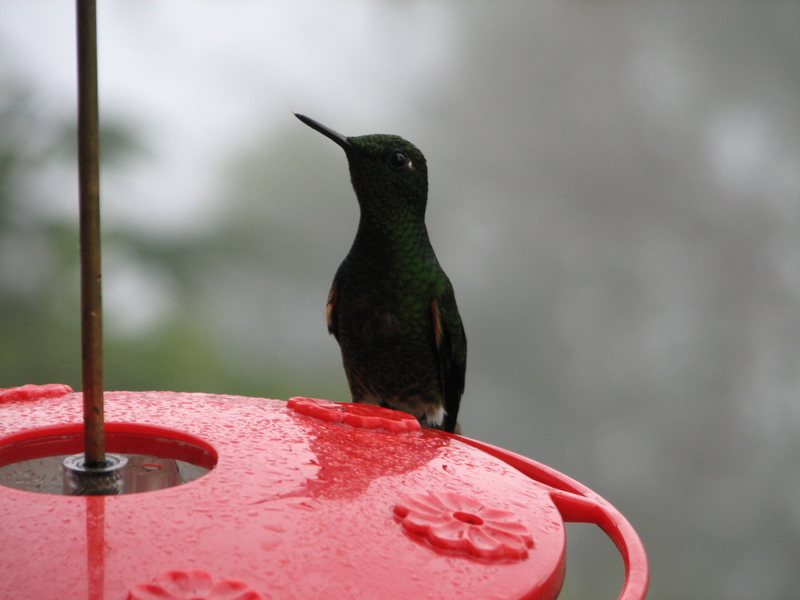 We talked about the ruby throated hummingbirds we see in Indiana at our feeders and how they migrate. He said they migrate south to Mexico and Panama and will fly across the Gulf of Mexico, over 300 miles, in one flight. He said it is amazing and science has yet to explain how this little bird that is no bigger than one’s thumb can fly that distance without stopping or needing to feed. Amazing how God designed these birds! 10:45 pm. We are back from a long day and will soon be going to sleep. Tomorrow Jane will pick us up and we will spend the day touring Quito. Father, Thank You for allowing us to get a glimpse of Your incredible creation. 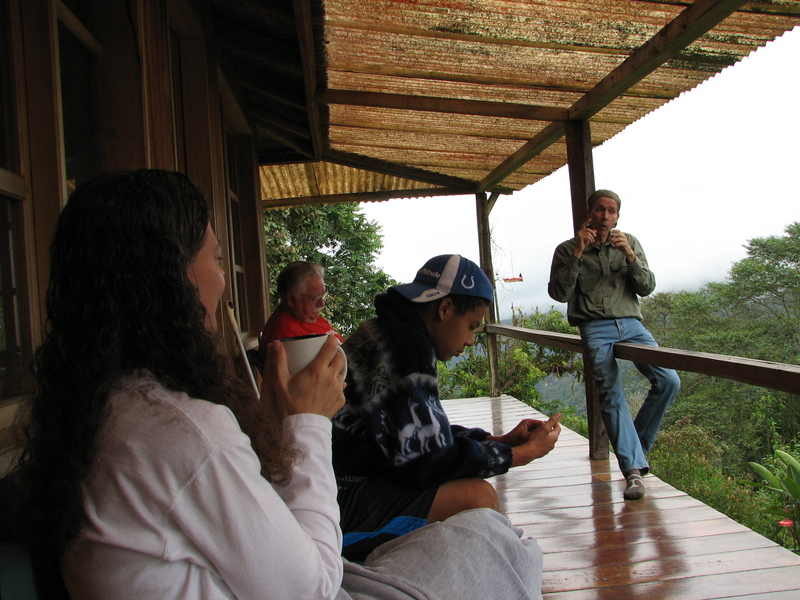 The cloud forest is truly spectacular even when the clouds were thick like fog as they rolled in on us at times. 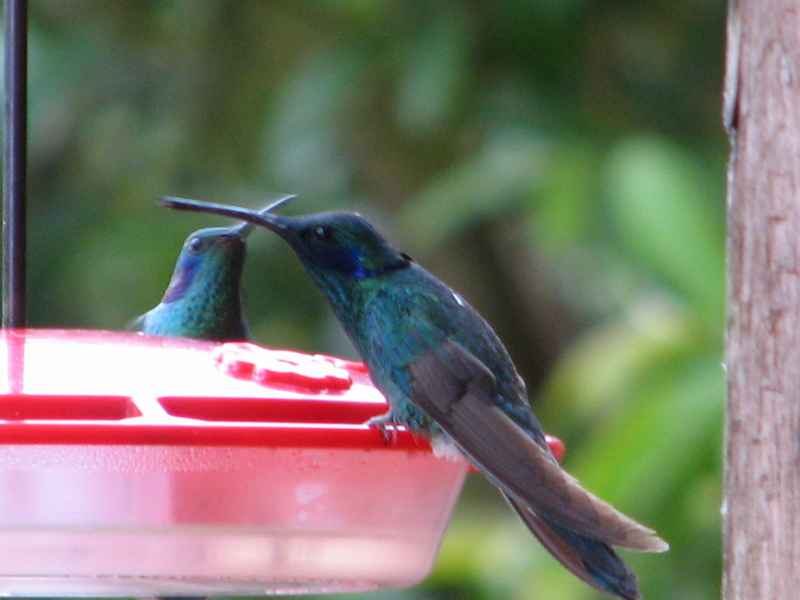 The hummingbirds are beyond description; they are so beautiful. Lord, Your infinite wisdom is on display here. Thank You for allowing us the opportunity to experience this. Father, thank You for Tony and Barb and their faith in You. Thank You for the work they are doing to help care for Your creation. Lord, thank You for the safety in our travel. I pray we all will have a good rest tonight. Thank You, Lord. Amen. So blessed by all you have written , Marv – truly we worship and adore our great Creator and Sovereign Lord God , safe travels home , Bud and Freda .